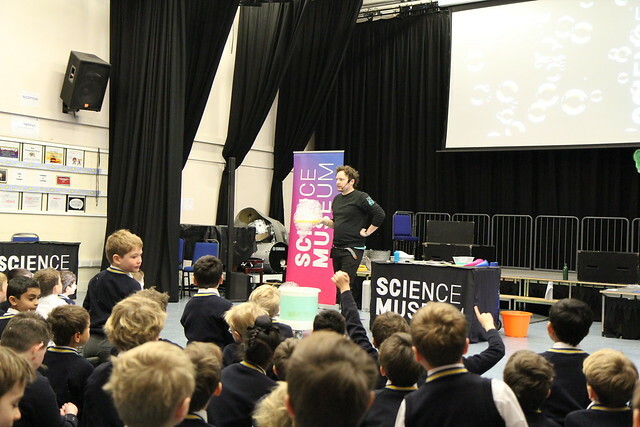 Science is a topic that is embraced wholeheartedly by the boys, so they were thrilled to be given the opportunity to welcome the Science Museum’s Outreach project to Davenies. Years 3 and 4 were ecstatic over the bubble show, they learnt how bubbles are made and were taught the art of ‘wafting’ a bubble to keep it floating through the air. Some boys were even lucky enough to be inside a huge bubble covering them from head to toe before popping. ‘It takes guts’ was the name of the game for the year 5 and 6 boys and it certainly took some guts to stomach this extremely detailed show as they followed the journey our food makes through the digestive system, from beginning to…. end. The year 7 and 8 boys were introduced to the world of Science Communication and how to present to an audience effectively. Split into groups they were given a Science demonstration to present to everybody. Once again, this was an exciting and awe-inspiring visit extending the boys’ learning and understanding of Science in the world around us.